“Low-power chip unites lasers and frequency combs for the first time and can be powered by an AAA battery, opening the door to portable devices for a wide range of applications from spectroscopy to optical communications to LIDAR. 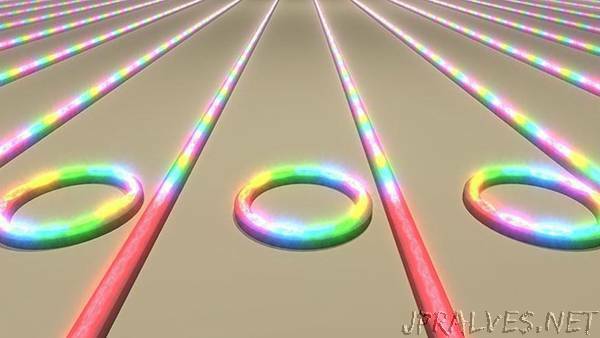 Optical frequency combs can enable ultrafast processes in physics, biology, and chemistry, as well as improve communication and navigation, medical testing, and security. The Nobel Prize in Physics 2005 was awarded to the developers of laser-based precision spectroscopy, including the optical frequency comb technique, and microresonator combs have become an intense focus of research over the past decade. A major challenge has been how to make such comb sources smaller and more robust and portable. In the past 10 years, major advances have been made in the use of monolithic, chip-based microresonators to produce such combs. While the microresonators generating the frequency combs are tiny—smaller than a human hair—they have always relied on external lasers that are often much larger, expensive, and power-hungry. Researchers at Columbia Engineering announced today in Nature that they have built a Kerr frequency comb generator that, for the first time, integrates the laser together with the microresonator, significantly shrinking the system’s size and power requirements. They designed the laser so that half of the laser cavity is based on a semiconductor waveguide section with high optical gain, while the other half is based on waveguides, made of silicon nitride, a very low-loss material. Their results showed that they no longer need to connect separate devices in the lab using fiber—they can now integrate it all on photonic chips that are compact and energy efficient. Microresonators are typically small, round disks or rings made of silicon, glass, or silicon nitride. Bending a waveguide into the shape of a ring creates an optical cavity in which light circulates many times, leading to a large buildup of power. If the ring is properly designed, a single-frequency pump laser input can generate an entire frequency comb in the ring. The Columbia Engineering team made another key innovation: in microresonators with extremely low loss like theirs, light circulates and builds up so much intensity that they could see a strong reflection coming back from the ring.